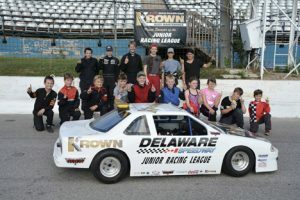 The KROWN BODY MAINTENANCE Junior Racing League is a program for 8-17 year olds that teaches the ins and outs of stock car racing. 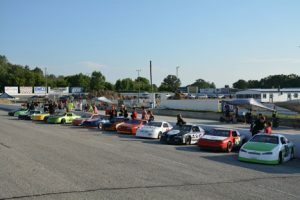 The program runs during the summer on Wednesday nights at Delaware Speedway. 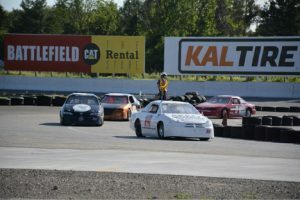 The racing is divided into two divisions, the Junior Division (8-12 Years Old) and the Senior Division (13-17 Years Old). The drivers do not compete for money, but for an end of the year scholarship. 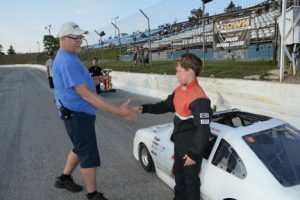 WHAT SETS THE JUNIOR RACING LEAGUE APART? We’ve been doing this for a while: the league was founded in 1997. Each week we bring nearly 20 years of Junior Racing Experience on our track into action. It’s not just racing skills, it’s life skills! JRL focuses on developing the “complete racer” coaching drivers on focus, communication skills, conflict management, managing stress, and learning from mistakes. Family-like atmosphere: teams help each other to everyone gets the most out of the experience. Fun, Fun and more Fun: generate friendships that will last a lifetime! As part of the Krown Body Maintenance Junior Racing League drivers participate in the racing program and attend classroom sessions. These special sessions are held after every race and count towards the end of the year championship. The sessions teach the drivers about subjects such as safety, public speaking, taking responsibility, the dangers of drugs and alcohol, vehicle maintenance, sponsorship, aerodynamics, engines and much more. Throughout the season the league also hosts various guest speakers. The league also coaches drivers on focus, communication skills, conflict management, managing stress, and learning from mistakes. The emphasis is placed on meeting and achieving individual goals. 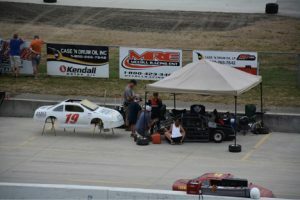 Junior Racing League Cars are specially designed half scale late model vehicles that are powered by sealed 9 HP Honda engines. They use a centrifugal clutch for drive. 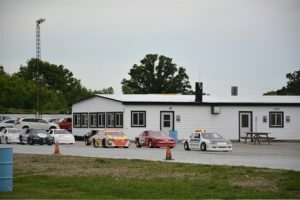 The vehicles are capable of speeds of up to about 100 KPH depending on the track but typically at Delaware Speedway’s inside road course they do about 40-50 KPH. The vehicles are surrounded by a full roll cage and fibreglass body. The chassis are manufactured at under license by a variety of individuals. Many teams report that their annual racing budget is the same or lower than what they would spend on minor hockey. Used cars range from $5,000* to $6,000*. New cars ready to race are $8,000*. You can expect to spend approximately $500* on safety equipment to get started. Well-maintained used cars typically maintain their value. An annual race budget varies depending on repairs and maintenance schedule. If planning to purchase a vehicle: contact the league for assistance. We are happy to walk you through the purchase and also know where used equipment is available. HAVE ANY QUESTIONS ABOUT THE KROWN JUNIOR RACING LEAGUE?